Apple has released iOS 12 for compatible iPhone, iPad, and iPod touch devices. 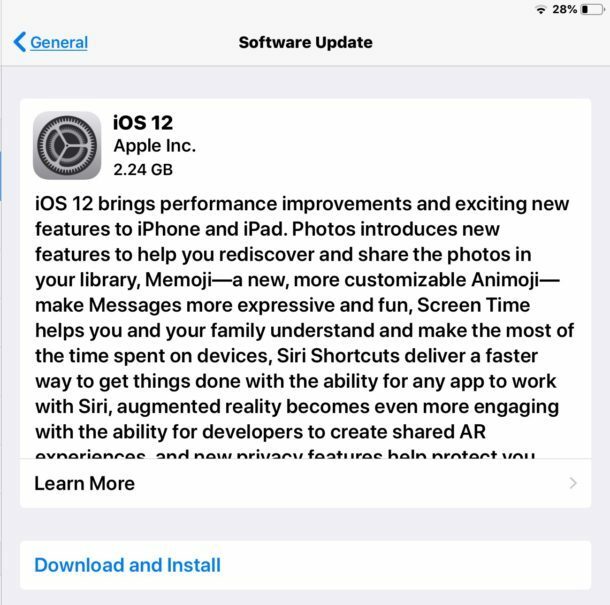 Basically any device capable of running iOS 11 can run iOS 12, and with the software update focusing on performance improvements Apple is recommending that all eligible users update to iOS 12.
iOS 12 features performance enhancements to app launching and camera opening, the ability to create personalized Memoji on some iOS devices, four new Animoji characters, new sticker capabilities in FaceTime and Messages, a helpful Screen Time feature that allows you to set limits to application usage and monitor device usage, a new Shortcuts app that sort of functions like macros to perform semi-automated tasks in iOS, new Notifications management options, and many other small changes and subtle improvements to the iPhone and iPad operating system. Later, iOS 12 will support group FaceTime with up to 32 participants. It’s a good idea to run through steps to prepare for the iOS 12 update if you have not done so already. Aside from performing some device housekeeping, the most important step by far is to backup your iPhone or iPad before installing the software update. 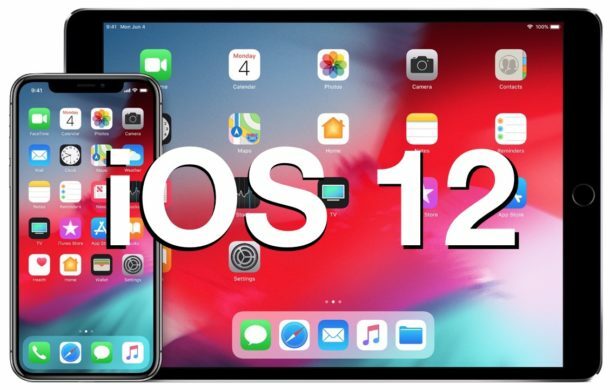 Assuming you have an device that supports iOS 12 you will find the software update available through the Settings app as well as the iTunes application, you can then use either to update the iOS 12 software. The software update will download and then install on the device, after a short while the iPhone or iPad will reboot and you’ll be updated to iOS 12. If you’re on a current beta build track, it’s generally a good idea to update to the final build and then afterwards remove the iOS beta profile so that you receive regular stable software updates rather than new beta builds. You can also update to iOS 12 using iTunes by connecting the iPhone, iPad, or iPod touch to a computer with the latest version of iTunes, and choosing to “Update”. Be sure you complete a backup to iTunes and/or iCloud before completing that update method as well. Using IPSW is considered somewhat advanced, though it’s not particularly complicated. If you downloaded the IPSW file and it’s not recognized by iTunes it is likely because of an improper file extension, typically as a .zip file which must be changed to .ipsw to work as intended. It’s possible that you’ll be able to downgrade from iOS 12 to iOS 11.4.1 for a limited time, so if you update and then decide you do not like the new version for whatever reason, there is typically a short opportunity to reverse course, assuming you made a backup beforehand. Separately, Apple has also released watchOS 5 and tvOS 12 for Apple Watch and Apple TV users respectively. In the coming weeks, macOS Mojave will launch for Mac users as well. iOS 12 is worth installing if you’re on iOS 11. If you’re on iOS 10, you might trade straight across for “performance” or may have a slight degradation. So think about your current use, and how performance is, and what is acceptable or what works for you. Not everyone needs to update system software. So yes it’s “faster” than iOS 11 because iOS 11 slowed down a lot of iPhone and iPad. But it’s still slower than iOS 10. LOL. Shortcuts for iPhone and iPad used to be called Workflow. It’s the same app, with a few new features because of deeper integration. It’s mostly the same experience, you can basically ask Siri to perform some simple automated tasks for you, like reading you headlines from a website, or telling you what appointments you have next on a calendar, etc. It’s no Automator or AppleScript that’s for sure. Thanks! I am trying to download the IPSW so I can DFU restore, but iTunes is telling me iOS 11.4.1 is the latest version for my 6S Plus..!?! I’ll use the link you guys posted then, THANK YOU! Based upon the file naming, this is the GM that was issued last week for the Beta users. So I assume no need to load again. True or False? Correct, the iOS 12 GM build from last week is the same as the iOS 12 final build from today. Might want to wait for some people. I’m running version 11.4 (15f79)on my iPad pro 9.7. I believe there’s another 11 upgrade but I’m not sure. Can I upgrade to OS12 skipping any upgrade after 11.4? Also would upgrading to OS12 have any negative effect like slowing down the system. iOS 12 is a performance improvement to iOS 11 on just about every iPhone or iPad. For iPad Pro I am sure that is the case too. Not really any new features, but performance is a tad better, comparable to iOS 10 on the same older hardware from the looks of benchmarking so that’s nice. I will wait for iOS 12.1 though. I have learned to always wait for the first revision after the major update. Let the public sort out the big problems if any exist, then I go ahead and update if at all. I skipped High Sierra on Mac entirely and am still on Sierra which is stable. I will see how Mojave behaves before going there. I’m running version 11.4 (15f79)on my iPad pro 9.7. I believe there’s another 11 upgrade but I’m not sure. Can I upgrade to OS12 skipping any upgrade after 11.4 Also would upgrading to OS12 have any negative effect like slowing down the system?. yea its no problem it works normally i tried it dont forget to backup before you upgrade Happy day !!!!!!!!!!! I found the link for 12.6.5 iTunes in case someone else needs it. Download data size always an issue for me, never do Apple state the size for us on limited data. Its 3.33GB not 2.24GB as per the screenshot at the top of this page. Is anyone else skipping this version because this upgrade features nothing us pros can use? iOS 12 is basically iOS 11.5, and as a forgettable update most people could skip it and not even notice, or you can update it and not even notice. If you’re on iOS 11 you might as well go to iOS 12. If you’re on iOS 10 or iOS 9 then ask yourself why, what are you hoping to get? The most noteworthy new ‘feature’ is Screen Time because you can put time limits on apps, which is nice for parents. Other than that, there’s…. emoji? This stuff about “Memoji” and “Animoji”…. who is this made for? How is that going to help me get more done, and be more productive? Thanks for the reply, i disabled everything apple sunday on the ipad because icloud, airdrop, itunes, safari etc does not fully work as expected with the other mac stuff in my house. Since the upgrade is an extra gb, i’ll pass and never upgrade again. Do you think they would notice or care? I can do much cooler things on my nexus 5 cm13 (2016) with nexmon and nethunter… Posting this from a 5s using tapatalk.